The CP3P Program is an innovation of the Asian Development Bank (ADB), the European Bank for Reconstruction and Development (EBRD), the Inter-American Development Bank (IDB), the Islamic Development Bank (IsDB), the Multilateral Investment Fund (MIF), the World Bank Group (WBG) and is partly funded by the Public-Private Infrastructure Advisory Facility (PPIAF) with a shared vision of enhancing PPP performance globally. The CP3P is exclusively accredited by APMG. 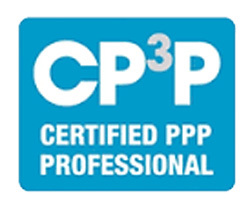 CP3P is the definitive credential to demonstrate your proficiency with international PPP best practices. It is designed for new and seasoned professionals tasked with managing complex projects within their communities who are interested in gaining greater global credibility, competitive advantage and superior technical competence. A two-day bootcamp covering P3 definitions, basic structures, overview of the P3 process, and basic project finance concepts. An exam will be administered at the end of the second day.